A few days ago, this picture was shared on social media sites with the caption "A humble Prime Minister". The photo was shared left , right and centre by thousands of people. Many went gaga over how humble their prime minister was. One of the comment was "He is the most humble human being I have seen on earth". When I read that statement, I could only laugh. 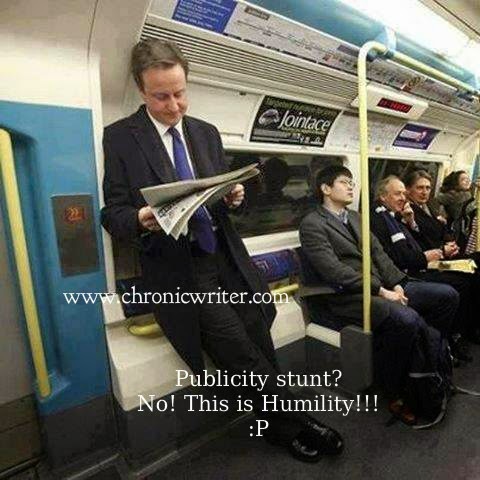 It even made me to think whether it was a public stunt by the British media to project Cameron as a humble man? I don't know personally about Cameron and I don't have any right to comment whether he is humble or not. But I do have my doubts about the media creating a hype around the issue. If you are a follower of the UK political scene you would know that David Cameron usually goes around in a chauffeur driven Bullet proof Jaguar with a battalion of body guards and Police escorting him. When he goes out in the streets, the service to the entire street is closed and it causes pain and panic to all the travellers. It is the same scenario in our country too where the entire roads get blocked when a VIP decides to travel on the road. Watch this video in which an entire street is blocked because David Cameron decided to walk into that street. His Jaguar is also seen here. If you closely watch the video, David Cameron will be making his entrance at 4:03 minutes. This is the main reason why the British media came out with a publicity stunt to make people believe that he was a humble man who stands and travels in a train. If standing and travelling in a train is a mark of humility, then 95 % of Indians who take the public transport are humble. Our very own Vadivelu has already performed this stunt long back in a movie. 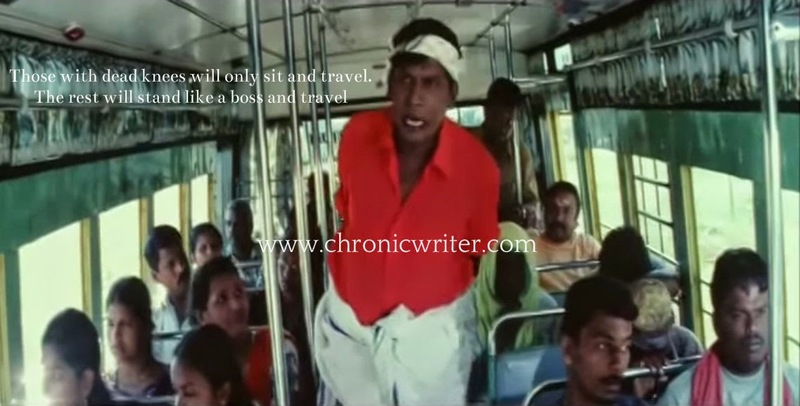 "Mutti sethavandhaan ukkandhutuu povaan"( Only a person with a dead knee, will sit and travel) is a philosophical quote of Vadivelu in that movie. We have already seen this scene in movies. So please come up with new creative stunts. Cameron as humble, lol. That is hilarious. He is a rich politician. He told her (Sanyogita Mayer) that he had used the train in Delhi, visited Mumbai and once received a signed cricket ball from Indian batsman Sachin Tendulkar. He even used an actor for his publicity drama! The Primeminister lives by 10 downing street in London , when we tried taking some pictures there we were confronted by a heavily armed cop and the pictures were checked before letting us go with a warning !! so obviously this cud never have happened . Just a plain sympathy stunt .